Inflorescence of Puya alpestris, copyright Junkyardsparkle. The Bromeliaceae, bromeliads, are a family of herbaceous plants found primarily in the neotropics (a single species, Pitcairnia feliciana, is native to west Africa). Many bromeliads have a vase- or tank-like growth form that encourages the formation of phytotelmata (pooling of water within plants). Numerous species of the family are grown as ornamentals. The Bromeliaceae have been divided between three subfamilies; however, the 'Pitcairnioideae' (with spiny leaves, capsular fruits and wingless seeds) are paraphyletic with regard to the rest of the family. The basalmost clade within the Bromeliaceae includes the genera Ayensua and Brocchinia; species of Brocchinia are mostly found growing on sand and sandstone in northen South America from Colombia to Guyana and northern Brazil. Other diverse, primarily terrestrial genera of 'pitcairnioids' include Pitcairnia and Fosterella, both of which are widespread in the Neotropics. Another widespread genus, Hechtia, includes species with thick, often spiny leaves. 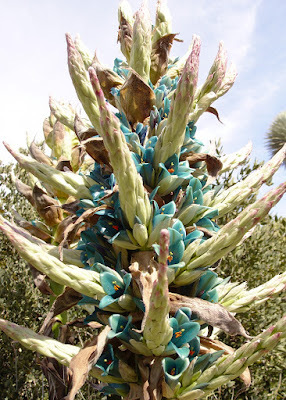 Members of the genus Puya, found in the Andes mountains, are noted for their monocarpic life cycle in which the plants die after a single flowering event. The queen of the Andes Puya raimondii is the largest known bromeliad, reaching a height of five metres, and usually lives for about eighty years before flowering. Characters (from Luther & Brown): Herbs, perennial, terrestrial, among or on rocks, or epiphytic. Roots usually present, often poorly developed in epiphytic taxa. Stems very short to very elongate. Leaves usually spirally arranged, forming water-impounding rosette, occasionally lax and/or two-ranked, simple, margins serrate or entire, trichomes nearly always covering surface, peltate, water-absorbing. Inflorescences terminal or lateral, sessile to scapose, simple or compound; bracts usually present, conspicuous. Flowers bisexual or functionally unisexual, radially symmetric to slightly bilaterally symmetric; perianth in two distinct sets of three; stamens in two series of three; ovary inferior or superior; placentation axile. Fruits capsules or berries. Seeds plumose, winged, or unappendaged. [C-SQ08] Carvalho-Sobrinho, J. G. de, & L. P. de Queiroz. 2008. Ceiba rubriflora (Malvaceae: Bombacoideae), a new species from Bahia, Brazil. Kew Bulletin 63 (4): 649–653.